Tucker Dordevic looks up field during the first half of Syracuse lacrosse's game. Mandatory Photo Credit: The Juice Online, Initra Marilyn. 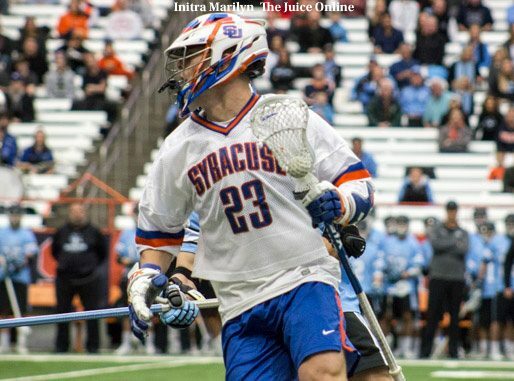 Item: The May 23 announcement that former Syracuse lacrosse great Ryan Powell has joined his brother Casey in consecutive years as a member of the 2018 class of the National Lacrosse Hall of Fame (with the duo to be joined by younger brother Mike in the suburban Baltimore Hall in the near future), enlarges the list of Syracuse players or coaches enshrined to a whopping 28 dating back over 60 years of inductees. When scouring over the list of Syracuse greats now in the National Lacrosse Hall of Fame, situated adjacent to the U.S. Lacrosse offices near the attractive suburb of Hunt Valley north of Baltimore, Ryan Powell’s selection means there have now been 12 players from the great championship teams (1983-present) to be voted Hall of Famers, and we’re again reminded that dating back to the first class of hall inductees in 1957, the Syracuse head coaching legacy has just four names attached to its 102 seasons, with three Hall of Famers to also be joined one day by John Desko and his five championships over the last 20 seasons. Go to Syracuse and “play for a Hall of Fame coach” has a pretty impressive sound to it, and most importantly, it’s factual. Eight years after finishing his playing career at Harvard, Laurie Cox introduced the sport at Syracuse in 1916, going on to not only serve as the head of the university’s landscape engineering department as a nationally respected landscape architect, but winning either four solo or shared USILA national championships during the 1920s. Upon Cox’s stepping down prior to the 1931 season, his former player Simmons Sr. incredibly coached the next 40 years, winning 253 games and grooming his player and son Roy Jr. to succeed him in 1971. Not only did Simmons Jr. build the modern program from scratch with an artistic, free-lancing style mimicking its coach, complete with the suddenness of the breakthrough 1983 title win over Johns Hopkins, but he in turn groomed his former player Desko to take the program into this century upon his retirement after the 1998 season, and that’s turned out pretty well 236 victories later. That’s over a century of top-level performance under the guidance of just four men, all acknowledged by their peers as among the best-ever in their profession. What school and program can match that longevity and success?